Portland artist Tom Fawkes paints lush scenes inspired by the landscapes of Italy and other reaches of the Mediterranean. He combines architectural elements with the imagery of gardens to depict light, space, and atmosphere. Layering rich passages of acrylic paint, Fawkes paints on canvas or wood panel, achieving an effect of trompe l’oeil that transports the viewer to the natural and human-designed beauty of foreign gardens and vistas. 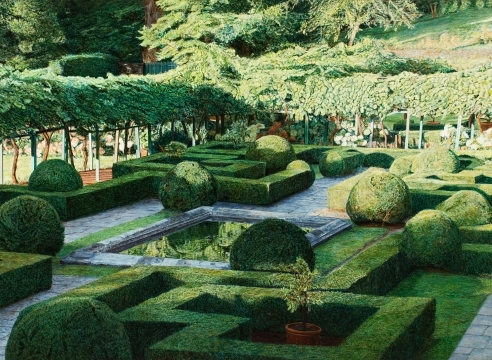 The work in this exhibition encompasses both manicured gardens and the architecture surrounding them, plus wider views of landscapes that have been sculpted and cultivated for centuries. An MFA graduate of Cranbrook Academy of Art, Tom Fawkes taught at the University of Oregon and the University of Wisconsin-Milwaukee in the 1960s. From 1972 – 2004, Fawkes taught drawing and painting at the Pacific Northwest College of Art. He received several awards including an OAC fellowship, an NEA fellowship, and a Rockefeller Foundation grant. His works are in numerous collections including Safeco, Microsoft, the Seattle Art Museum, and the Portland Art Museum. Currently his work is on exhibition as part of In Passionate Pursuit: The Arlene and Harold Schnitzer Collection and Legacy at the Portland Art Museum.